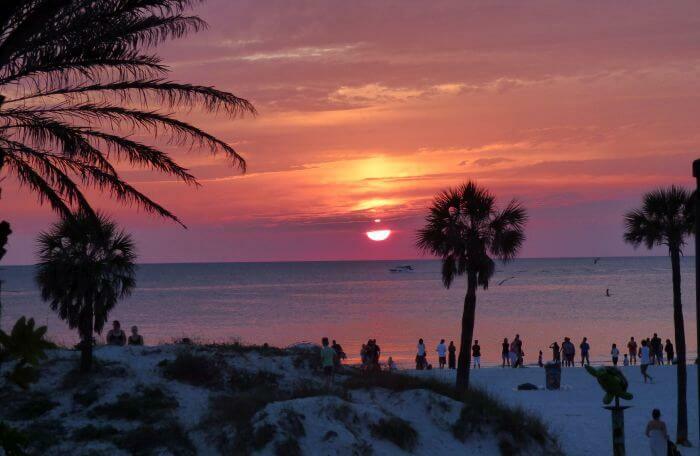 Which are the best Clearwater Beach hotels for your Florida vacation? For many years this has been a moving target, with old dinky motels getting torn down, replaced by fancier (and more expensive) resorts that are dazzling instead of dull. 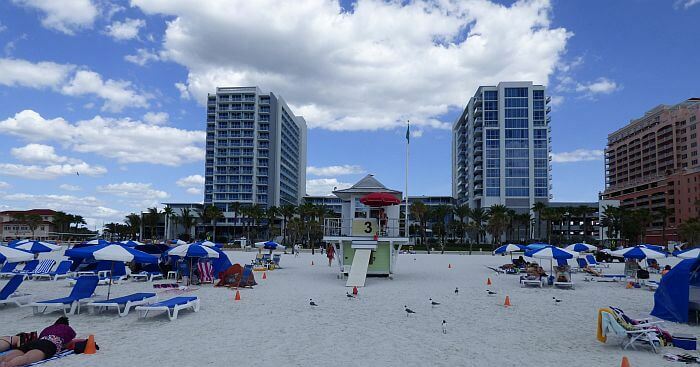 In the space of two decades, the Clearwater beachfront resorts have gotten bigger and better. 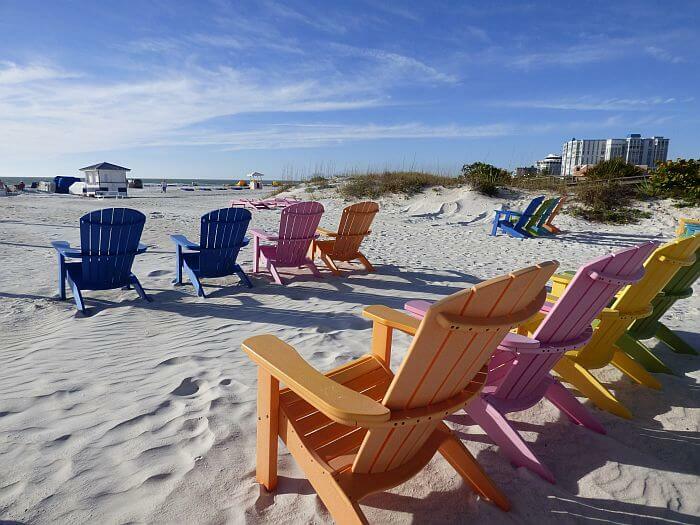 As this transformation moved forward, the area got more and more accolades as a top beach destination in Florida. There are plenty of great air connections to the Tampa airport, plus direct Allegiant ones to the St. Pete airport. If you leave Orlando by car, you can be on the beach in Clearwater about two hours later, so it’s a nice getaway after the theme park madness. I’ve lived in the Tampa Bay region off and on for many years, so I’ve watched some of these Clearwater hotels go from announcement to construction zone to grand opening. There will probably be a few more coming still, but they’ll likely be back a block from the beach: there are no more low-rises to tear down along this beautiful stretch of sand. 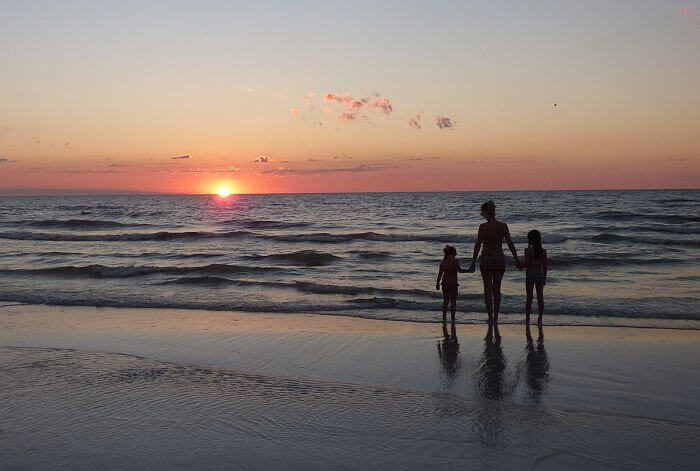 Here are picks for the best Clearwater Beach places to stay for your weekend holiday getaway or escape-the-winter beach vacation. The decor and furnishings are the most traditional in the area, so the clientele tends to be older, wealthier, and more subdued than at more modern properties down the beach. With a well-renowned restaurant, sumptuous rooms, and experienced service, this is a good choice for picky travelers with fat budgets. Rates dip below $200 in the low season but can hit four figures for a suite in peak months. See more information at the company website or book online here. 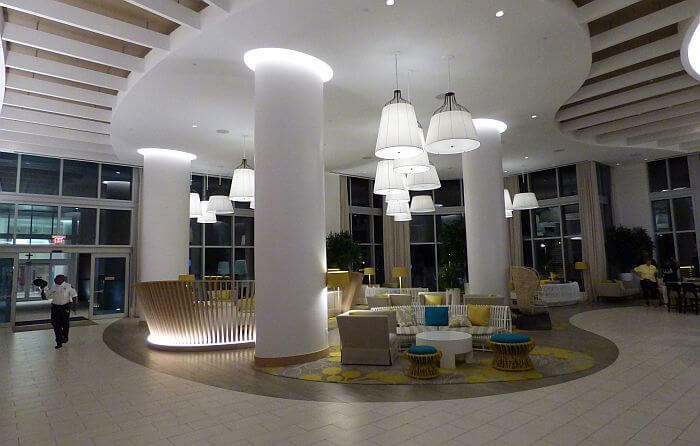 We stayed at Opal Sands Resort at the far southern end of Clearwater Beach soon after it opened. You would never know from walking around it that it’s owned by the same company as the Sandpearl because the design differences are like night and day. This one is a sleek high-rise with bright colors, bold artistic sculptural elements, and modern rooms that will delight the young and hip. You get an attractive pool complex with attentive wait staff, multiple dining outlets and bars, and terrific views. You’ll never search far for an electrical outlet or USB port in your room and you’ll have a balcony for kicking back with a view. The one drawback here is that you’re on a rocky point instead of facing the sand, but it’s just a few steps down from the pool before you’re strolling on the beach at sunset. 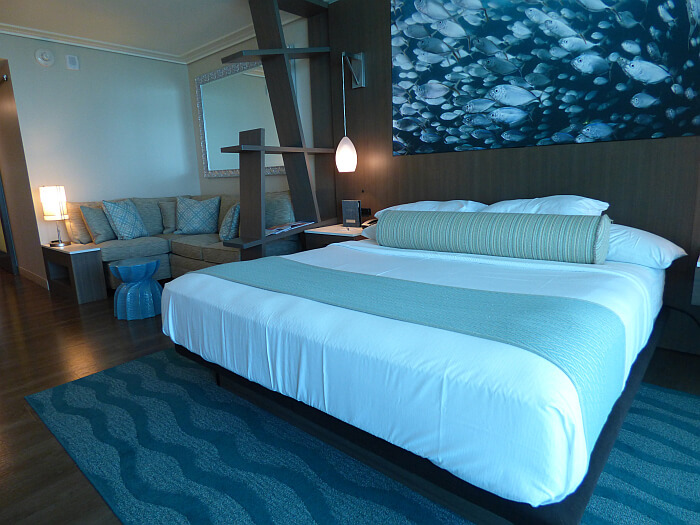 See more details in our full review of Opal Sands Resort and check prices online. The pool area here is terrific when occupancy is low, but is woefully inadequate when more than half the 287 rooms are filled. The basic rectangle quickly fills up with kids in vacation season and chairs can become scarce. On the plus side if you’re a parent, this Hyatt has a full kids club with dedicated food menu, a kiddie pool, and supervised activities. Check the official website for more info and check online prices elsewhere here. The year after Opal Sands opened, a new Wyndham Grand celebrated its grand opening in a prime spot right next to the Hyatt. This is flashy resort with modern sensibilities, including some of the most tricked-out and attractive rooms in the Tampa Bay area. There are some nice subtle touches in them like a shelf by the door (for what you need heading out) and a foot stand in the shower (for shaving legs). Although it seems a bit odd to have an Asian-themed restaurant as the main dining outlet, it’s a very good one and there’s plenty of seafood. Another more casual outlet is one level down on a public sidewalk. The bars have a few local craft beers on tap, including the one right by the pool. Alas, the pool here suffers the same problem as most others in this area, but worse. There are around 450 units between two towers here, but the pool in the middle of them is sized for a hotel 1/4 that size, with 200 lounge chairs. You’ll need to pony up more cash to rent one from an independent vendor on the beach instead. Try to avoid weekends in high season if you plan to lounge poolside. 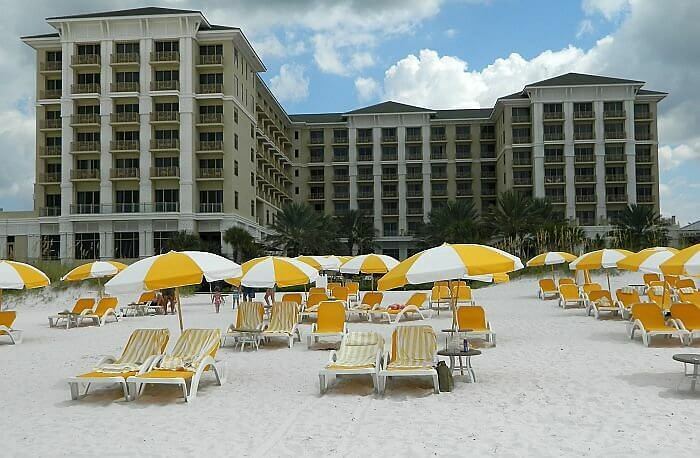 See our full review of Wyndham Grand Clearwater Beach and check rates online at Expedia. 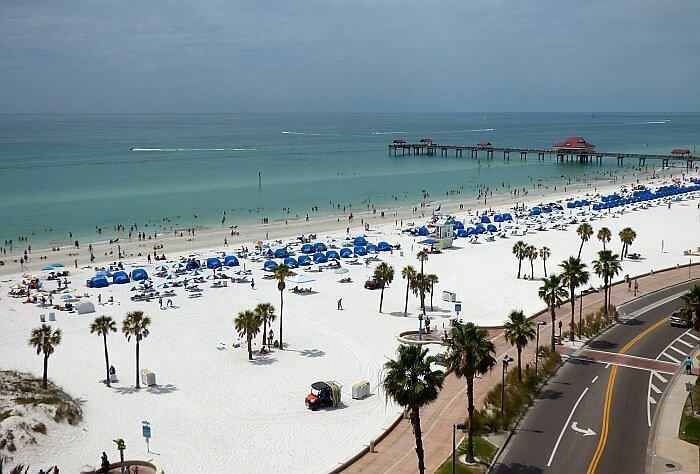 Value is a relative term in Clearwater Beach, where the average rate many weekends is well above $300 in peak months, but the Springhill Suites from Marriott is a reliable choice. It went up on the same lot as a Marriott Residence Inn. These are actually the newest rooms in town at the moment, the latest “demolished old motel to build new high-rise” conversion. The hotel is two streets back from the beach, with the Hyatt blocking most of the views, so don’t book here expecting a panoramic Gulf of Mexico vista. You’re just a block away from the beach though and an easy walk to the pier, restaurants, the marina, and bars along the strip. You can earn or cash in Marriott points at either one of these sister hotels and you’ll get all the predictability that comes from a Marriott brand hotel. Nothing that will wow you, but all the bases will be covered and breakfast is included—a rarity in this resort town. Check rates here for Springhill Suites or adjoining Residence Inn. If you’re coming to this beach area, be advised that most of the hotels have colluded to overcharge you well beyond the listed rate on booking sites. 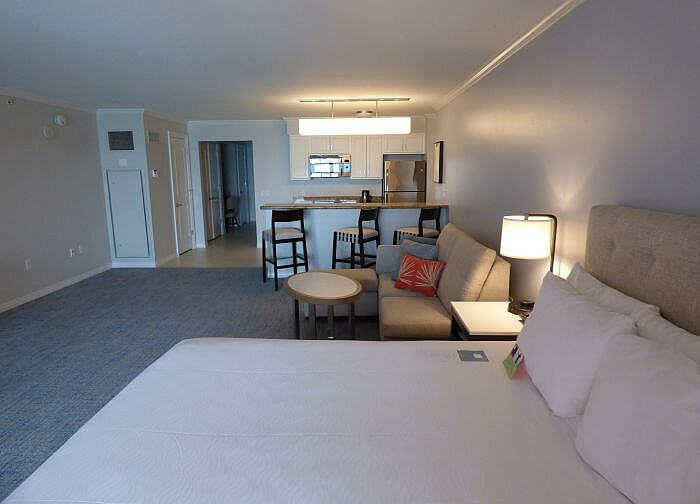 The dreaded “resort fee” is a staple here, with the Wyndham Grand, Opal Sands, Hyatt, and Sandpearl all charging $30 or more per night after taxes for such “extra” items as WiFi, a pool towel, and gym access. So if a price pops up of $309 for an off-season weekday night at Opal Sands, you’ll really end up owing $379 per night when you go to check out because of taxes and this fee for things that should be included in the rates. If this picking of your pocket multiple times makes you angry, click through the rates before booking to see what’s included. If you do that with Springhill Suites, you’ll notice there’s free WiFi and no resort fee. Same with nearby Pier House 60. Bring the family + your gadgets and enjoy! Then there’s parking though, which will often run as much as the resort fee. Even at the Springhill Suites, for example, your nightly rate may only be $150, but you’ll owe $27 per night for parking if you brought a car. At the Hyatt it’s $28 per night, at the Sandpearl $25 plus tax. The smartest way to get around this is to park in Clearwater City for free and take a short ferry over to the marina if you drove in. Maybe drop off the bags first with the bellman if you have a lot of luggage. Or if you don’t mind just popping over to the beach for the day and then relaxing elsewhere with a view of the water, you might consider the new Fenway Hotel near Dunedin. They’ve got a pool, a roof deck, and are walking distance to seven microbreweries. 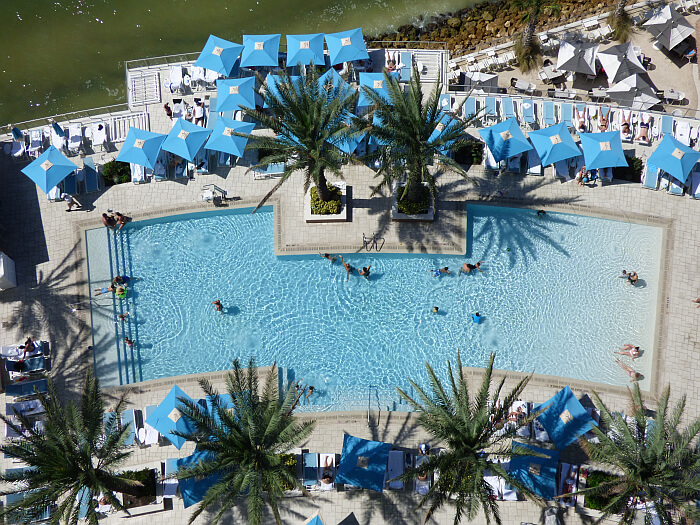 Review and photos by Hotel Scoop editor and lodging expert Tim Leffel, who has lived in Tampa Bay for the past three years. He was hosted at several of the listed resorts over the years but as always, all opinions are his own. The resort fee plague has really got to stop. It’s just a pickpocketing move and a way to pay less commission to agents or booking systems. Most of the time it’s a real bait-and-switch too because they don’t disclose it in the posted rates. It’s not until you get to the payment page that you find out you are getting charged 10-15% more than what you thought. That often makes me abandon the booking and find somewhere else to stay out of principle.